One of Dalia Association’s founders, Nora Lester Murad, is celebrating her 50th birthday this month. But instead of throwing herself a party, Nora decided to launch a Fund for Gaza at Dalia Association. 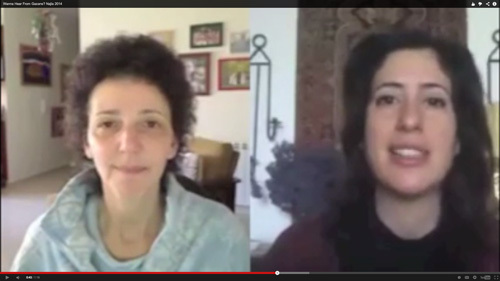 We met with Nora to ask her about her initiative and what it means for Dalia Association. What is your Gaza Birthday Campaign? Why did you start it, and why did you choose Dalia Association? Nora: As I approached my 50th birthday, I realized how distraught I am about the state of humanity. With all the violence we inflict on one another, the harm we cause the planet, and the senseless waste of human and natural resources, it feels like we’ve lost our way. I’ve always been concerned about the kind of world I’m leaving to my children. Now that I’m turning 50, I feel I must work faster and smarter to do my part in advancing social change. So, I decided to celebrate my birthday by giving a gift to the world every day for the month leading up to May 5. I recorded and edited short video interviews with people from Gaza talking about interesting aspects of their lives—rationing of electricity, early marriage, recycling, the importance of international solidarity—whatever they felt they wanted the world to know. I’ve been posting one video clip on my personal blog everyday and asking my readers to help me celebrate my birthday by taking action to end the siege on Gaza. I decided to open the Gaza Fund at Dalia Association because my special relationship with the organization continues even though I left my role as director, and I still believe strongly in Dalia’s efforts to promote Palestinians’ right to self-determination in development. Gaza’s 1.7 million Palestinians have been practically locked in Gaza for years. If none of the concerned international governments or human rights organizations have been able to end the siege, what exactly do you think regular people can do? Nora: I am asking my readers to do three simple things. First, I want them to take a political action, like writing a letter to a political representative or the media demanding an end to the siege. Each time we express our opinions, it adds one more voice of reason to the global discourse and empowers politicians to do the right thing. Second, I want them to sign up to get regular news from at least one organization that works on ending the siege on Gaza. The Palestine Solidarity Campaign is one source of information; Gisha is another, and there are more. I know that people are busy juggling priorities. There are many issues around the world that demand our attention, and there are personal matters we have to attend to also. But I firmly believe that if we only think about Gaza when a crisis brings it back to the headlines, then we’re missing the opportunity to make a difference. It’s important that we keep informed and let the politicians know we’re watching. Lastly, I’m asking people to make a financial contribution to the Gaza Fund at Dalia Association as a practical way of challenging the siege and expanding Dalia’s important rights-claiming work into the Gaza Strip. Why did you choose to focus on Gaza? Why didn’t you open a fund for Palestinian citizens of Israel or a fund that focuses on climate change? Nora: I’d like to open those funds too. I started with Gaza because I had to start somewhere. Dalia Association’s idea that anyone can open a fund—in their name of a village or town, a family, a company, a target group of people, or a cause—is very inspiring. It means that anyone who cares can use Dalia Association as a mechanism to turn their compassion into real social change. It doesn’t matter very much where we start. I chose Gaza because I love the people and I want them to be free. So Gaza doesn’t have anything to do with your birthday? Where did you get such an unusual idea? 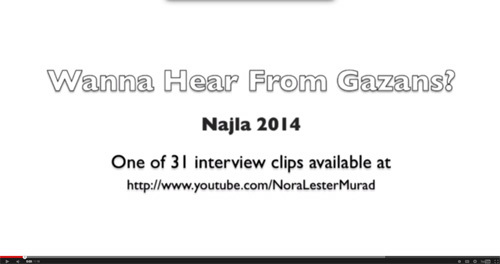 Nora: No, Gaza doesn’t have anything to do with my birthday! I just figured that people tend to be very generous around birthdays. They buy flowers and bake cakes and send gift certificates. I don’t need any of those things, but I do appreciate people’s warm wishes. So, I thought it would be fun and build awareness if I invited people to direct their generosity towards me on my birthday to a cause that is both urgent and inspiring – investing in Palestinian rights to development in Gaza. The idea to celebrate my birthday with a philanthropic campaign isn’t really that unusual. There are many creative ideas for promoting philanthropy these days. I don’t want mine to be a gimmick. I want to engage people around the world with what’s happening in Gaza, get them to feel part of it, and excite them about giving in an ongoing way. People are probably wondering what you will do with the money. Have you decided? Nora: Hopefully people are starting to grasp that Dalia Association isn’t like other development organizations. The most basic value that lies at the core of all Dalia’s work is that Palestinians have the right to decide themselves how to use their development resources. That’s why Dalia’s programs in the West Bank utilize “community-controlled grantmaking.” That same philosophy will be promoted through Dalia Association’s Gaza Fund. In other words, it won’t be me or Dalia Association that decides how to use the funds. It will be Gazans themselves. Precisely how will that work when Dalia Association staff can’t even enter Gaza to explain the program, train people, monitor progress, and make sure the money is spent correctly? Nora: That’s an excellent question. Sadly, I have no answer. Dalia’s work in the West Bank is very relationship intensive. Staff and volunteers are always in villages working with people directly. Since Dalia staff can’t get permission from Israel to enter Gaza, they will have to find other ways to get the work done without compromising the quality or credibility of the work. They might have to rely more on volunteers in Gaza, or devise creative ways to use social media. The point is that Dalia’s work is so unique, and the conditions they work under are so challenging, they always have to be creative and courageous. Sometimes they try something and it doesn’t work as expected the first time or the second, but Dalia’s long term commitment to work with Palestinians means that eventually they will succeed, and much will be learned along the way. Your campaign ends on your 50th birthday on May 5th. Are you happy with how it’s progressing? Nora: To be honest, I am not. I’d hoped that more people would be leaving comments about the video clips on my blog, and that the comments would include people’s ideas about how to influence Israeli and international policy on Gaza and the reactions they’d gotten to their advocacy efforts. I’d hoped to have more media coverage of the campaign. And I’d hoped to have more money by now. There are only $1,420 so far, and that’s not good enough! If someone wants to be part of the Gaza Fund, what do they have to do and by when? Nora: Everyone is invited to contribute to the Gaza Fund at Dalia Association, and making any donation, even if 10 NI (about $2.50), makes the giver a part of the Dalia Association Family. They can donate by credit card (tax deductible in the US) either one time or monthly. They can send a check or bring cash to the Dalia office in Ramallah. There is no deadline, since this is an ongoing effort, but if it’s convenient, it would be great to have initial contributions by May 5 so I can celebrate. Dalia Association wishes Nora a happy birthday on May 5 and hopes the Gaza Fund generates many thousands of dollars, inspiring tens of thousands in local in-kind and volunteer contributions.